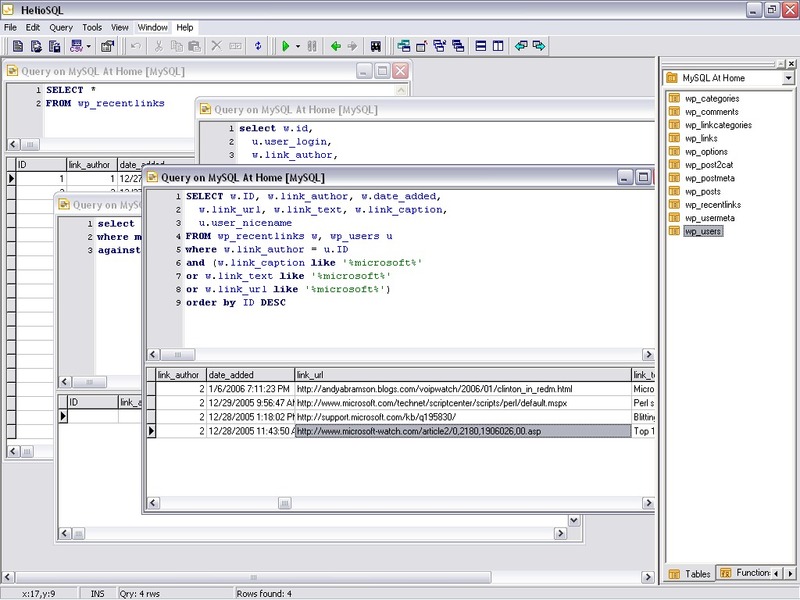 Earlier this year, I noticed that I needed to have an SQL editor cq. analyzer tool: both Borland and Microsoft tools did not meet my requirements: all of the vendors tool had either not the ability to connect to multiple (and wide range) databases or did not have specific features I needed right away (like import/export of data). I’m considering features that are currently in Squirrel-SQL (which is also a perfect SQL companion, except for that it is written in Java, which may work for you or not). At this stage there is no download available. I have no ideas about licensing nor do I have plans to make money out of it at this stage. Currently, I already use HelioSQL on a daily basis. If you happened to have a copy, consider yourself lucky. You can look at the pretty screenshot though. I’m currently in the process of rewriting HelioSQL. Please notice: Per 02/10/08, HelioSQL has become part of the legacy project-page. Please refer to HelioSQL.Net for further information.